The new Fuji Portaflow-C uses the same measurement principle as Fuji's ultrasonic flowmeters of which a great number have already been delivered. Transducers located outside an already installed pipe constitute a sensor for finding out the time interval between transmission of an ultrasonic signal and its reception which is variable with the flow rate. The flow can be obtained from this interval. Since only an ultrasonic wave is admitted into the pipe, the liquid suffers no pressure loss; thus the flow can be easily measured. 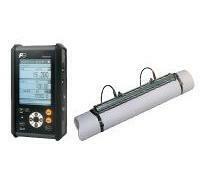 Fitted with the standard sensor it can make a flow measurement for pipes with a diameter ranging from 50mm to 400mm. When equipped with the optional large sensor, it can be used for pipes with a diameter of 200mm to 6,000mm. Non-revenue water specialists use the Portaflow-C to identify the minimum night flow in the district meterd area, before the leak survey and after the repair of the leakage.